Oru Vadakkan Selfi is very old wine in a wonderfully crafted bottle. The bottle is aesthetically designed, cleansed, lined with gold and polished to look like new. The storyline revolves around a good-for-nothing Umesh, the son of a small time grocer who is hellbent of being lazy to make a mess of his education and life. His sidekick Shaji, is someone who has pretty much given up on education and is mostly living his day-to-day life to have some fun more than anything else. The storyline gets complicated when a girl at Umesh's neigbhoring house , Daisy, goes missing and some unfortunate series of events place Umesh with her the night of her disappearance. Lest you get all worked up over the disappearence or the veil of suspense, there enters a slew of characters including the movie maker himself taking us through a wonderful ride through the remote villages of Tamilnadu in the guise of chasing a character who passed away more than an year back in the story. The movie tries to warn the younger generation of the very pitfalls of internet and cellphones (An oft repeated theme these days in Malayalam Movies), however by using the social media as the tool to pique and sustain the interests of the generation. Vineeth Sreenivasan and his friends including his Director Prajith deserves kudos for creating a light hearted movie that is so pleasant to watch. Cliches are used in abundance, but with the deliberate attempt to marry the old world and the new. Nivin Pauly, as he always does these days excels in this tailor-made role for him and so does Aju Varghese. New face Manjima Mohan doesn't have much of an opportunity to demonstrate her histrionics, but looks quite comfortable and confident in the role given to her. Porutham Sreelakshmi is marvellous as Umesh's mom who is floating in the naivete of the modern world. The ensemble support cast also does a solid job. The music department of Shaan, Vineeth and Co, yet again has scored a home run, this time with Vaikkam Vijayalakshmi joining the fray for the out of the world rendition of Kaikkottum Kandittilla. It is an absolute delight to hear the witty Malabar-flavoured lines written by Vineeth Sreenivasan in Kaikkottum Kandittilla – how often do you hear kaikottu and kithaab and kachara in a Malayalam song? Vaikom Vijayalakshmi may not have the authentic accent, but she more than makes up for it in her power-packed rendition, even as composer Shaan Rahman produces a sprightly background (the dhols and harmonium!) to the proceedings. In Enna Thallendammaava Vineeth’s lines sound like a tongue-in-cheek response to Kaikkottum. The arrangement carries a sense of déjà vu at its core, but Thaikkudam Bridge man Govind Menon’s violin solos and Sumesh’s guitar work are enough to make you overlook that. Topped with a wonderful vocal job by Vineeth and Shaan. The song’s video (at the end of the review) has also helped its cause big time. The duo’s third song too is a wacky one. Titled Chennai Pattanam, this one comes with Tamil folk percussion and a very sing-along-ish jingle-like tune. Vineeth is supported by Arya Mohandas behind the mic. Short, but effective. Yekkam Pogavillai’s Tamil words and the rock-based song built around them last just over a minute and a half, too short to make a solid impact. Shaan does a fine job of singing it while it lasts. Composer ropes in Agam frontman Harish Sivaramakrishnan for Paarvana Vidhuve. And playing to the singer’s strength, Shaan gives the song a classical fusion touch. Though composer does not manage to keep up with the very promising start he gives the song, it does make for an engaging listen. Singing is fab all through, Harish is supported well by Haritha Balakrishnan. Arun Alat gets the only melody of the soundtrack, Neelaambalin. A genre that he hardly fails with, Shaan delivers a sweet ditty here too, highlighted by some lovely use of violins (Cochin Strings). Also beautiful is the way Kavya Ajith’s voice is employed in the backdrop. Oru Vadakkan Selfie. 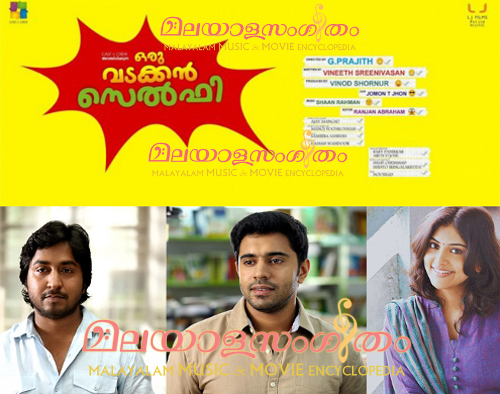 The ever-reliable team of Shaan Rahman and Vineeth Sreenivasan delivers yet again!